We’d love your help. Let us know what’s wrong with this preview of School Bus by Donald Crews. To ask other readers questions about School Bus, please sign up. Never really had to ride the bus to school...but is there anyone who does not feel a bit nostalgic when a yellow school bus goes by? Great story for a child before they have to take their first trip on the bus. If you've read any of Donald Crews's picture books about vehicles, you know the format. Using as few words as possible, he shows what a particular kind of vehicle does on a typical day, from the moment its motor starts until after it's shut down for the day. 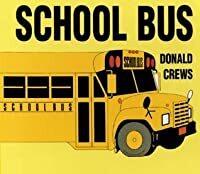 In this book, the classic yellow school bus gets the Donald Crews treatment. Anyone who has boarded a school bus in the morning, crisscrossing town to pick up other kids before classes begin, knows the sensations rendered in this book. Many If you've read any of Donald Crews's picture books about vehicles, you know the format. Using as few words as possible, he shows what a particular kind of vehicle does on a typical day, from the moment its motor starts until after it's shut down for the day. 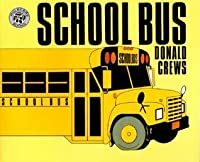 In this book, the classic yellow school bus gets the Donald Crews treatment. Anyone who has boarded a school bus in the morning, crisscrossing town to pick up other kids before classes begin, knows the sensations rendered in this book. Many people have vivid memories of riding the bus to and from school. School buses don't simply materialize when it's time to pick up kids. They're stored at bus shelters, waiting for their wheels to be needed. In big cities and small towns alike, buses are dispatched wherever kids need transportation to school. The kids climb on, parents wave goodbye, and the weekday begins. The buses reverse the route in late afternoon, their cumbersome frames rumbling away from school to take the kids home. The whole long day will resume again tomorrow. First sentence: Yellow school buses large and small. Empty yellow buses cross the town. STOP. GO. Going this way. Going that way. Here it comes. See you later. Full buses head for school. Premise/plot: Donald Crews gives us a day in the life of a school bus. The book comes full circle, beginning and ending with empty buses gone 'home again' in a parking lot. My thoughts: This book is very yellow. It doesn't have the same rhythm and rhyme thing going for it as Freight Train does. Nor is it really a First sentence: Yellow school buses large and small. Empty yellow buses cross the town. STOP. GO. Going this way. Going that way. Here it comes. See you later. Full buses head for school. My thoughts: This book is very yellow. It doesn't have the same rhythm and rhyme thing going for it as Freight Train does. Nor is it really a concept book like Freight Train was. (Freight Train is about COLORS.) The language is simple. I think little ones could definitely learn to read this one. The art is simple, perhaps a little too simple. It does give us a diverse group of people waiting for buses, riding the buses, getting off the buses, etc. While there could be some pros perhaps to having all the humans lack facial features, I prefer faces. I'm not sure I'd call this book "dandy entertainment" like Publishers Weekly did back in the day. In fact, I doubt I've used the word DANDY even once in one of my reviews. This book on school buses would be perfect for the kindergarten classrooms. The text doesn't say much, so it would age appropriate for that age group. It’s important for a classroom that is having a transportation curriculum to have this book included in with it, as for it shows children the daily process of riding on the school bus. As the school bus in the book travels down the street, you will see a multitude of other types of vehicles, such as; taxi’s, cars, trucks, and buses. When the school This book on school buses would be perfect for the kindergarten classrooms. The text doesn't say much, so it would age appropriate for that age group. It’s important for a classroom that is having a transportation curriculum to have this book included in with it, as for it shows children the daily process of riding on the school bus. My 2-yr old is into school buses and the color yellow. This book is perfect for the stage he is in. He loved counting the buses and seeing the different sizes. Daddy read this to me last night. I love school buses so I liked the book, but my favorite part was pointing out the lone garbage truck! What is not to love if you are interested in school buses! It was a sweet and simple book about buses. Buses are nice forms of transportation (Not so much in middle school and high school where you smell body odor from pubescents who don't wear deodorant.) Anyway, it's a pleasant book for kids who are beginning to learn to read! Again, Crews does a great job using the simple theme of transportation to tell a small story that can be relatable for kids all across America. I would use it on the first day of school to talk to students about how they get to school and what their bus experience is like. Calling all school bus enthusiasts! Though simple in text, this book is full of bright yellow buses of all shapes and sizes, in groups and on their own, on their way to and from school. Love Donald Crews’s style! A day in the life of a bunch of school buses -- from the bus barn to picking up kids, taking them to school, waiting, picking them up, taking them home, and back to the bus barn. This book is about seeing school buses, waiting for them, going to school, and going home. The pictures show streets, people, and school buses. This book would be great for young children. I always followed reading this book up with doing a round of The Wheels on the Bus. It just makes sense. The very first book my son read on his own! Have it on video too. So cute. Good for very young kids. Didn’t have a lot of words, but the illustrations were good. Decent book. Not very descriptive with words but lots of pictures of buses. My five-year-old picked it out off his shelf. I was incredibly bored. He seemed more into it, but that's because he's legitimate excited about riding the bus to kindergarten. This may have been translated from another language. We like the pictures. Good intro to school buses, traffic, and signs. My two-year-old could not possibly have been more thrilled with this book. He has chosen it for his bedtime story every night since we checked it out from the library and literally shrieks with glee as we turn the pages together. I do read the text, but I don't think he really cares. He is much more interested in describing the pictures to me and "counting" the buses. I really like the illustrations and very My two-year-old could not possibly have been more thrilled with this book. He has chosen it for his bedtime story every night since we checked it out from the library and literally shrieks with glee as we turn the pages together. I really like the illustrations and very simple text in this book and Freight Train, another Crews book that is very popular at my house. ETA: We have read this book every single night for at least six weeks. I've renewed it from the library twice. Apparently we are going to have to purchase our own copy. Small children are fascinated by large vehicles, and this important institution of American society, the yellow school bus, is no exception, especially because small children associate the bus with interesting older children and teenagers. This well-conceived, well-illustrated preschool book traces school buses through one day: beginning parked side by side in the lot, crossing the town, picking up students, bringing them to school and back, then returning to the parking lot. The minimal text per Small children are fascinated by large vehicles, and this important institution of American society, the yellow school bus, is no exception, especially because small children associate the bus with interesting older children and teenagers. This well-conceived, well-illustrated preschool book traces school buses through one day: beginning parked side by side in the lot, crossing the town, picking up students, bringing them to school and back, then returning to the parking lot. The minimal text perfectly captures the ponderous rhythm of a school bus's movements, and there is a pleasant reiteration of the phrase "home again," as students disembark in their neighborhoods, then "home again" as the buses return to their yard. So The Boy is currently obsessed with buses. All things larger than a Ford F-150 are buses—dump trucks, excavators, Greyhounds, oil tankers—you name it. This might be because those are two of the words that he can say ("bus" and "yellow") that are recognizable by people other than his Mama and Papa. Anyway, I made the mistake of showing him this book while at Borders. So now we own it. All told, it's pretty straightforward and linear. Buses pick up kids, take them to school, and then home again. Wh So The Boy is currently obsessed with buses. All things larger than a Ford F-150 are buses—dump trucks, excavators, Greyhounds, oil tankers—you name it. This might be because those are two of the words that he can say ("bus" and "yellow") that are recognizable by people other than his Mama and Papa. What disturbs me is the mysterious attrition that takes place w/r/t/ the buses in the story. At the beginning there are 32 buses. At the end? A mere 16. Something is amiss and I haven't quite put my finger on it. School Bus is a book about the journey of a school bus. School buses are empty in the morning and cross town. They stop at red lights and go at green lights. They pick up the kids and take them to school. Then, they wait until school is over and then takes the kids back home. They then go back home themselves to their parking lot. I did not care for this book much because it did not teach me anything new. I would put this book in my classroom library. Good book. Built background knowledge by asking students if they ever rode on a yellow school bus before, which sparked a discussion of shared experiences riding the school bus for field trips. Used it for predicting, although the title would seem like a dead giveaway. Then made a chart to find out how students get to school. We discussed which means of transportation students used the most to travel to school and which means students used the least. Worked out pretty well. This is a very easy beginners book with very few words on each page. It would be a good book for Pre-K or Kindergarten because they need to learn how the process of riding the school bus works. The setting of the book is through town on the school bus and at the school. I feel that this would be a great book for a child learning to read. I love Donald Crews' books and this is one of the better ones. We read it in my preschool special education classroom each year and the simple language, paired with all those pictures of buses, is always a hit. I particularly like the little details, like the father who is putting his child on the bus and waiting to hug her when she comes home. Donald Crews (born August 30, 1938) is an American illustrator and writer of children's picture books. In 2015, the American Library Association (ALA) honored him with the Laura Ingalls Wilder Medal, recognizing his lasting contribution to children's literature. Common subjects of his include modern technology (especially travel vehicles), and childhood memories. His stories often include few huma Donald Crews (born August 30, 1938) is an American illustrator and writer of children's picture books. In 2015, the American Library Association (ALA) honored him with the Laura Ingalls Wilder Medal, recognizing his lasting contribution to children's literature. Common subjects of his include modern technology (especially travel vehicles), and childhood memories. His stories often include few humans. Two of his works were runners-up, or Caldecott Honor Books, for the ALA's annual award for picture book illustration, the Caldecott Medal. Donald Crews was born in Newark, New Jersey, in 1938. He had an older brother, Asa who became Beth Israel Hospital's first African-American intern, and two sisters. His mother worked as a seamstress, and his father worked at the railroad, and several other odd jobs. For the summers he would travel down to rural Florida to stay with his grandmother, who he called "Bigmama". The difference between the big city and the farm caused him to create two, massively different types of art later on in his life. From a young age, his talent for drawing was encouraged by his family and his teachers. When he got into high school, one of his teachers became a mentor to him, and personally made sure that he got into art school. He graduated from Cooper Union for the Advancement of Science and Art in New York City, and married another graduate, graphic artist Ann Jonas. Crews was drafted into the army in 1963, and sent to Frankfurt, Germany. Their first daughter, Nina was born in Germany, and their second was born a year later in New York. Nina is also an award-winning children's book author. While in Germany, he worked on several pieces for his portfolio, including the book We Read: A to Z (1967). After several suggestions from friends, he submitted it, and it was published by Harper & Row (now HarperCollins). The book relied on abstract ideas, rather than the clichés that were usually associated with ABC books. One classic example is the entry for the letter C: "Cc, corner: where the yellow is" is illustrated with a yellow square in the far corner of a red page in the book. He created several other books over the next few years, but it was 1978's Freight Train that won him a Caldecott Honor and the respect of other artists in the field. He won another Caldecott Honor the next year for Truck. Several other transportation themed books followed, such as School Bus (1984), Flying (1986), and Sail Away (1995). His memories from his summers in Florida first appeared in Bigmama's and later in Shortcut. These stories are vastly different from his previous works, in that they focus on humans, and tell a more linear story.